Globus Group is a leading manufacturer of Personal Protective Equipment (PPE). Our approach to protecting people at work has delivered enhanced safety & productivity to companies in the majority of industries. Our solutions are designed to be easily adopted & include technologically advanced products from our Alpha Solway, Riley & ENHA brands. A unique safety hard hat that has revolutionised head protection across mainland Europe thanks to its innovative design features is now available in the UK and Ireland thanks to Personal Protective Equipment (PPE) specialist Alpha Solway. Providing enhanced impact protection and comfort for workers across a wide range of industries, the award-winning Ranger safety helmet features the unique Crashbox protection system, created by renowned head protection manufacturer ENHA. Crashbox is an integrated, double-walled impact absorption system located on the crown of the helmet. It is designed to absorb impact energy, instead of the wearer, in the event of an impact from above. It achieves this through specially designed cylindrical rods that drive into corresponding cylinders in a rotating motion when an impact occurs. This absorbs the energy to minimise the force on the wearer’s head. Ideally suited to workers in the construction, utilities, manufacturing, engineering, petrochemical, metal working and forestry sectors, Ranger is designed and manufactured in ENHA’s German ISO 9001 certified facilities. The shell is constructed from an ABS/Polycarbonate/UV blocker blend, exceeding EN 397 standards having been tested under different temperatures between +50°C and -30°C. The UV blocker also slows down UV degradation, increasing the helmet's lifespan by up to 50% - which means it can be used for up to 6 years if undamaged. Wider user benefits include a padded ratchet adjustment system, which is quick and easy to use with one hand, even when wearing safety gloves. Further innovations also include patented oval shaped slots on the side of the hard hat which refrain from cracking should permanent pressure be applied from the attached personal protective equipment. A range of accessories is also available including reflective sticker sets, retractable safety eyewear (Integraspec) and the fast-click 4-point chin-strap. Joining Ranger is the specialist E-Ranger safety helmet. Designed specifically for electrical applications, E-Ranger not only incorporates the Crashbox impact absorption system, but also reduces the risk of exposure from high voltage conductors (up to 1000V AC or 1500V DC). It also comes with a range of optional metal-free accessories and is resistant to molten metal. Find out more about the ENHA Ranger safety helmet, or call +44 (0) 1461 202452. ENHA GmbH and Alpha Solway are part of Globus Group, world leaders in protecting people. Renowned disposable respirator manufacturer Alpha Solway is helping protect workers against the threat of breathing hazards with the launch of the new Alpha Flow™ Series, which includes the UK’s first P3 charcoal filter. The five-product Alpha Flow series has been designed to improve comfort and performance whilst maintaining a secure fit to provide enhanced breathing protection for workers coming into contact with dust, fumes, vapours and particulates across a wide range of industry sectors. Providing effective breathing protection in environments from textile manufacturing through to the iron and steel industry and underground civil engineering, every product in the series has been manufactured in accordance with EN149: 2001+A1 2009. 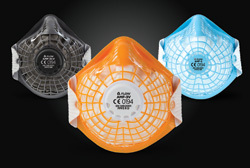 Offering breathing protection from FFP1 to FFP3, the new Alpha Flow Series – which is colour coded for ease of identification when varying levels of protection are required – protects against a range of respiratory hazards from non-toxic dust (FFP1) through to environments where workers will encounter potentially hazardous oil and water-based particulates (FFP3). The higher performance FFP3 charcoal model is the first of its type in the UK and loaded with activated carbon to protect against nuisance odours and organic vapours. Three products in the range also benefit from a newly designed, larger exhalation valve which reduces heat build up, improves wearer comfort and thanks to its lower profile, increases field of vision. A specially designed four-part manufacturing process ensures the Alpha Flow masks are kept in prime shape for optimum filter performance thanks to an innovative new mesh shell design. The new design also features a preformed nose bridge which not only eliminates the need for regular adjustment, but also prevents glasses from misting due to the immediate fit it provides. Completely metal-free and therefore suitable for use in the food industry, further features include a large filtering surface area ensuring very low breathing resistance and an adjustable head strap allowing for a secure and comfortable fit. The head strap holder on each side of the mask also has a ‘winged’ design which not only makes wearer adjustments extremely easy, has incredible strength over traditional staple designs. They are also compatible with a wide range of safety eyewear. For more information and to request trial samples on the new Alpha Flow Series visit www.alphasolway.com/flow, email: sales@alphasolway.com or call +44 (0)1461 202 452. The Alpha S has been specifically designed to ensure an excellent fit for the smaller face. The unique inner face seal helps maintain a close and snug fit around the chin area which is generally regarded by experienced fit testers to be the main weakness on standard design disposable respirators. Working closely with the fit2fit accreditation scheme and numerous users, Alpha Solway has developed a simple solution to an industry wide problem. The 3000 SERIES disposable respirators offer an outstanding level of protection demonstrated when conducting Face Fit Testing. Having electrostatic filter media allows low breathing resistance and a lightweight outer shell maintains excellent shape. Created by a dedicated team of safety eyewear experts with decades of experience, the launch of Riley represents a completely fresh approach to eye protection. Engineered using the latest safety eyewear technology, innovative designs and unique performance features, Riley is ideally suited to a wide range of industrial applications. Key developments include the TempFLEX™ system – flexible, Thermoplastic Elastomer (TPE) side arms and temple tips giving an exceptional feeling of comfort around the ears whilst gripping securely. Further design features include an inclinable temple mechanism, adjustable nose bridge and length adjustable temples, enabling the wearer to create a high comfort, tailored fit for their individual face shape. Robust polycarbonate lenses provide high performance protection from impacts, delivering perfect optical quality in accordance with EN166 whilst three specialist coating technologies have also been developed – the Riley TECTON™, Riley TECTON™ 400 and Riley ARIDA™. For enhanced durability on the inner and outer surfaces of the lenses, the TECTON™ coating, available as standard across the majority of the range, delivers the highest-grade anti-scratch and anti-fog treatments available. The TECTON™ 400 coating offers high level UV protection whilst moisture-repellence is provided for outdoor workers through the ARIDA™ coating. Every model in the glasses range comes with a variety of lens tint options allowing safe working in a wide array of environments and conditions. The contemporary and sports designs are available in full frame and single lens variations along with wrap-around and panoramic options. There are also non-metallic versions – designed for critical environments such as pharmaceutical manufacturing, food production and electrical maintenance. Where wider impacts and splash protection is required the new Riley goggles are lightweight and comfortable thanks to the soft PVC/TPE frames including comfort nose bridge and padded seals. Protection is delivered through impact-resistant polycarbonate lenses offering a wide field of vision, with the option of an accompanying face shield, guarding against wider liquid splashes including molten metal and airborne particles. Several models in the range can also be worn over prescription frames. The award-winning Ranger safety helmet features several innovative attributes including the Crashbox, a crumple zone in the top of your helmet. 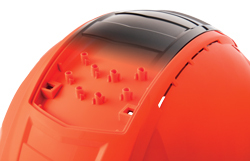 Helmets in the ROCKMAN range feature an array of options and features to satisfy a wide range of applications. Not only is the range award-winning, but each hard hat exceeds the demands of EN 397:2012+A1:2012. The award-winning E-MAN is a high-quality helmet with a modern design that protects against short-term accidental contact with electrical conductors. For extra protection against impacts, the E-MAN range also features ENHA’s patented Crashbox. E-MAN is also equipped with a fully retractable visor that protects the entire face.